What happens when an oak tree soaks in a swamp for thousands of years? It turns a sinister black as the evil of that dank, fetid water is absorbed into the fibers of the once-mighty oak. This stuff is seriously cool, and it’s older than Methuselah dating to the Bronze Age when a tree fell in a swamp in what would one day become Eastern Russia. And, yes, it made a sound. The sound of gamers yet to be born crying out with glee in anticipation of obtaining an epic level Bronze Age relic for their gaming table. 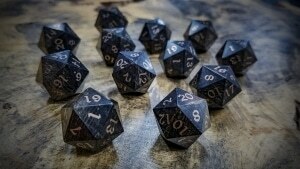 These d20s have been crafted from a special form of Bog Oak called a burl. A burl is a benign tumor that forms on the side of a tree. You’ve probably seen them before, big bark covered ball-shaped growths. Those cancerous growth turn the typically straight-grained wood in to a gnarly mass of awesome. To find one of these rare burls on a 5000 year old tree preserved at the bottom of a dark fetid swamp, is as rare as you’d probably imagine. So we had to do something extra to make these dice truly unique, and what better way to showcase these Bronze Age pieces of history, than to inlay their numbers in actual Bronze.